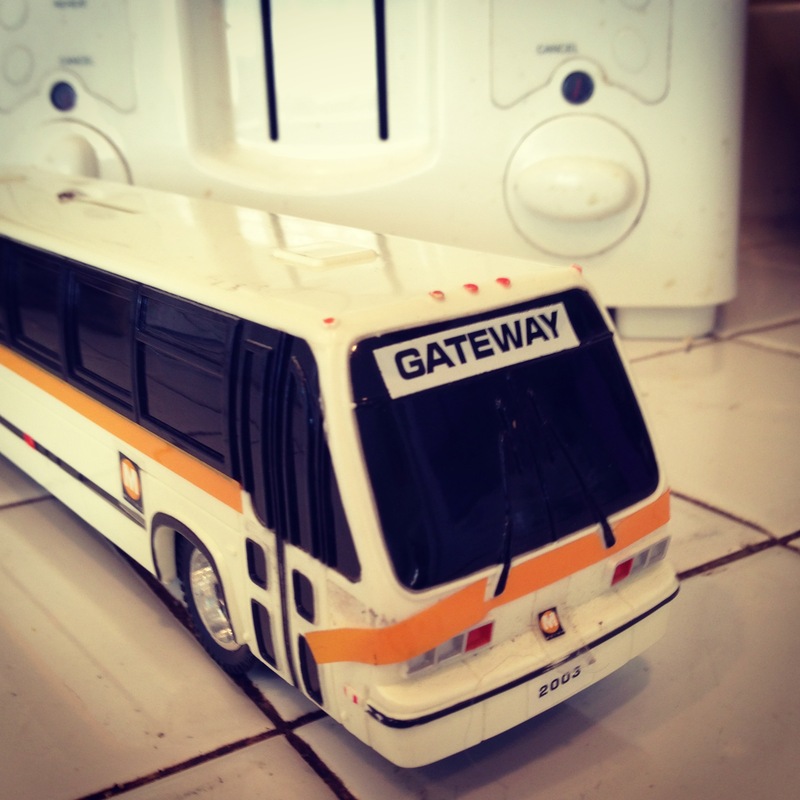 ART OF TRANSIT: My awesome new Metro bus piggy bank navigates the kitchen counter. A friend found this in her office and gifted to yours truly. Prepare yourselves dear readers: giant yellow lab toys with bus photos are just a matter of time. Photo by Steve Hymon/Metro. A brief get-up-to-speed segment keyed to last week’s community meeting on the Purple Line Extension. Unless my eyes deceive, it looks like a quick shot of the Washington D.C. Metro snuck its way into the piece toward the end. His frequently updated stream of photos of construction on the second phase of the Expo Line has a new home. There’s a whole crop of new photos of work on the bridge that will carry the tracks over Venice Boulevard and toward Palms, West L.A. and Santa Monica. The Dallas Area Rapid Transit agency is trying to lure motorists by offering a weekly regional pass in exchange for their latest gas receipt. It’s part of a promotion for Dump the Pump Day and a weekly regional pass normally goes for $50. I meant to post this yesterday as it got a little lost in the news. The California High-Speed Rail Agency’s Board, as expected, accepted the staff recommendation and awarded a contract to build 29 miles of track bed, trenches and bridges to the Sylmar-based firm. Ron Tutor appeared before the Board and defended his firm’s work, which has been criticized by some in the past. Before work can begin, the rail agency still must acquire some key parcels and a favorable ruling in a lawsuit brought against the project. What happened to the Metro Store? It went away about three years ago. May come back at some point in some other form. I assume the bus was purchased there many moons ago. That is the first time I’ve really seen news coverage about the extension. Maybe its good, maybe its bad? It is good to see that its getting much more public attention in my opinion though. The more transparent it is, I think the more people will understand the benefits of the greater picture. Once the really heavy construction begins and tunnel boring machines are involved, there will be a lot more news coverage. I think the print media has written a fair amount in the past couple of years. The electronic media: not so much and they’re not as detail oriented. You speak the truth Steve! Yes, that certainly was a clip of the DC Metro in the news video. Perhaps that was the only stock footage they had on hand, or maybe they wanted to show how a different subway might look. …And the electronic media is driven by “visuals.” Further, Conan is a known friendly to transit and trains. Can someone please stop the insanity of high speed rail and instead focus on the funding for metro and metrolink on their worthy projects?